* Literature In the Internet Age category, #1: I'd normally be skeptical of a trailer for a short story -- but the story is by Jim Shepard, the publisher is the very intriguing new multi-format literary journal Electric Literature, and the video itself is somewhat breathtaking. Watch. * Literature in the Internet Age category, #2: our Brooklyn visionary of the literary future, Richard Nash, writes in Publishers Weekly about Cursor, the new print/digital, publisher/community hybrid creature he's working on creating. I'm still wrapping my head around it, but it seems to come down to the fact that writers are readers and vice versa, and thus offering tools for refining and publishing one's writing while also selling the written works (and the rights thereto). Looking forward to seeing how it all plays out -- like ours, I imagine the business plan evolves constantly, and I trust Richard to come out with something fabulous. * Literature in the Internet Age category, #3: another visionary, Kevin Smokler (his anthology Bookmark Now! was one of the reasons I started blogging, AND thinking that bookstores have the potential to be viable and progressive) announces a leap forward for his brainchild, BookTour: author tour listings on BookTour will be automatically listed on the author's A****n page. I've had some interesting email volleys with Kevin and other indie booksellers this week about what this new feature, undeniably a publicity boon for authors, means for indies, and how we can continue to work together. Importantly, BookTour's partnership with site-which-shall-not-be-named does NOT prevent them from also showing this info in other places. And at the moment, indie bookstore data compiled from IndieCommerce sites does NOT appear (partly because they have to figure out how to filter out the "Jane Austen" and "Barack Obama" listings when a bookclub is listed; partly because the booksellers aren't sure they want them to). At some point they may reappear on Amazon, which would delight authors; at some further point, BookTour data may show up on IndieBound in some form, which would delight bookstores (cross your fingers for that). I'm impressed with Kevin's grasp of all the various stakeholders in this situation, and his commitment to continue to serve indie bookstores, as well as authors and readers. * Didja notice -- Greenlight Bookstore is now on IndieBound! Also, our storefront is turning green. * And finally: my scarily witty ex-colleague/successor Dustin Kurtz does some terrible things to books in the video below. If you notice the camerawork is a bit shaky and there are some snorty, chokey sounds in the background, it's because he let me hold the Flip camera and I was kinda laughing. He seriously did eat those book pages. Buy him a drink sometime. (And don't try this at home.) As he put it on Twitter, "booksellers are the new circus freaks." Long may we live in passionate weirdness. 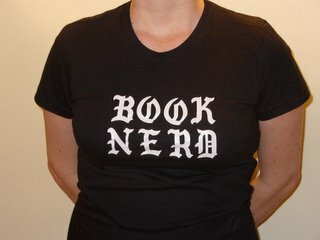 Link-Mad Monday: Booksellers at it again! * I love the long-running feature on the music/culture blog Largehearted Boy in which "authors create and discuss a music playlist that relates in some way to their recently published book." The most recent entry is by Joan Silber, one of my top 5 favorite authors, about her most recent novel The Size of the World (just out in paperback and PERFECT for smart, exotic, moving summer reading, by the way). I'm currently listening to The Mighty Clouds of Joy on her recommendation - weird awesome disco gospel. Okay, that's enough for today. I'm going to continue organizing my publisher catalogs (and exercising my Gmail Ninja skills) in preparation for tomorrow: First Full Day As Full Time Proprietor, Knocking it Outta The Park! Today is my last day at McNally Jackson Books. Tomorrow I will be the full-time proprietor of Greenlight Bookstore. It feels weirdly like the last day of high school. There's something about working in an indie bookstore which makes for a much more emotionally heightened workplace atmosphere than, say, working in an office. Some of us call it the "Empire Records phenomenon" (which is the best silly '90s movie about indie retail life ever -- highly recommended if you are of a certain age and sensibility, though I take no responsibility for it.) I've noticed a similar sense of cameraderie working in a restaurant -- the amount of physical work you do together makes for a set of shared jokes, systemic quirks, annoyances, and ways of working with and around each other that tends to bond coworkers pretty quickly. But I think it's even more pronounced in a bookstore (and maybe a record store) -- there's a shared intellectual life as well as a shared physical experience. Not that we sit around and talk about Literature all day, but we're all doing this because we love books in our own particular way, and our engagement with books is part of our engagement with each other. Additionally, I've never worked anywhere that the employees were as engaged and invested in the life of the bookstore as they are at McNally Jackson. This is primarily Sarah McNally's doing: she is both a visionary and an expert delegator, finding for each person the area of expertise where they can excel and giving them a great deal of autonomy in running it. Displays, signage, section maintenance, book clubs, and yes, author events are in a constant state of tweaking and improving, because they are run by booksellers who have the opportunity to figure out how to make things work better. This, too, makes for a strong bond to the store itself, since we all have a very real role in its existence and identity. There are a million other reasons why working at McNally Jackson has been a rewarding and affecting experience -- but I'm running out of time. Allison, John T., Katie, Dustin, Adjua, Yvette, David, Cheryl, Erin, Rebecca, Stewart, Angela, Doug, Brook, Eddie, Darrell, Sam, Jane, Byron, Gabi, Eva, Sandy, Keala, Caroline, John M., Yvonne, Javier -- you are damn fine booksellers and friends of mine, and I will miss you. After tonight's author event, we're going out to a local watering hole for a proper drunken sendoff. I'm grateful for a moment to savor what has been, before turning my eyes to what's ahead. It is far too beautiful outside for blogging. I'm making chicken salad sandwiches for a picnic in the park. If you are inside in New York City, I suggest you get outside as soon as possible. Happy Friday! On Monday, I was part of an amazing panel discussion as part of NYU's Summer Publishing Institute. It was inspiring and thought provoking, and I plan to write up some notes and thoughts that came out of that soon. Today I would like to point out two things that made me laugh out loud in my bathrobe, and caused the ALP to shake his head at the wonder and ridiculousness of it all. They involve two of the things I love the most: books and Brooklyn. First, Shelf Awareness linked to the Green Apple Core, the blog of the amazing Green Apple Books in San Francisco. It seems Green Apple has a fantastic program wherein they recommend one book a month, guaranteed good or your money back. And every month, they shoot a two-minute video promo for the book -- every one of which is freaking hilarious. This month's book is Werner Herzog's Conquest of the Useless, but my favorite video (I watched them all) is for Little Bee. This cracks me up. What's most awesome is how much fun the booksellers are having making these -- their goofy enthusiasm is infectious, and I can only imagine leads to sales of the featured books. I may have to steal this idea for Greenlight Bookstore someday.